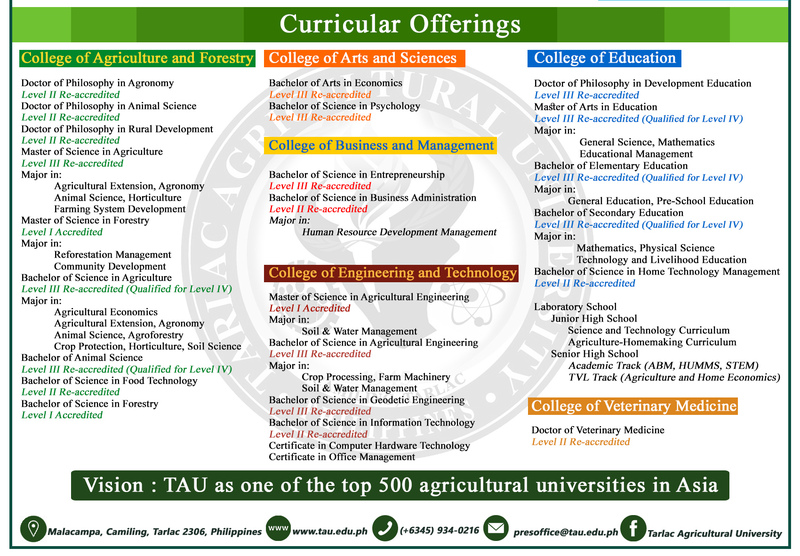 To facilitate cooperation towards the implementation of the Learning Management System component of the “SMART University Platform for TAU,” the Tarlac Agricultural University (TAU) and the Southeast Asian Ministers of Education Organization – Regional Center for Educational Innovation and Technology (SEAMEO-INNOTECH) entered into a Memorandum of Understanding at the latter’s office located at Quezon City, Metro Manila on December 2, 2016. Dr. Max P. Guillermo, TAU President and Dr. Ramon Bacani, Center Director of SEAMEO INNOTECH represented the two institutions, respectively, in the signing as witnessed by Dr. Ernesto A. Viray, Vice President for Academic Affairs, Dr. Edmundo Baccay, Director for Curriculum and Instruction; Dr. Christine N. Ferrer, ELIA Director, all from TAU and Mr. Benito E. Benoza, the other party’s Manager for Knowledge Management and Networking Office. With this, TAU became the pioneer state university partner of SEAMEO INNOTECH in Region III alongside the private higher educational institution, Angeles University Foundation (AUF) in Angeles City, Pampanga. Meanwhile, the LMS or Learning Management System as one of the components of the “SMART UP for TAU” proposal approved for the University by the Commission on Higher Education (CHED) National Vetting Panel under the K to 12 Institutional Development and Innovation Grant (IDIG) – Internationalization Category, is a milestone in connection to the establishment of pedagogical platform of the project. As such, being the Regional Center for Educational Innovation and Technology, SEAMEO INNOTECH will conduct technology transfer to the University specifically the following programs for implementation: (1) GURO21 which is a flexible learning course designed to enhance the capabilities of Southeast Asian teachers in addressing the teaching-learning requirements of the 21st century, (2) Change Excels or Change Management Excellence in School Leadership Southeast Asia, (3) PD Excels or Professional Development Excellence in School Leadership, (4) SEA Excels which is a flexible learning course on strengthening capacity of school heads to promote the understanding of the Southeast Asian community, (5) Super Excels or Supervision Excellence in School Leadership for Southeast Asia, (6) Teach Excels or Teaching and Learning Excellence in School Leadership for Southeast Asia, (7) I Excels or the Instructional and Curricular Excellence in School Leadership and Management in Southeast Asia, (8) The Impact System or Instructional Management by Parents, Community and Teachers, (9) Peace Education or the Excellence in School Leadership for Southeast Asia, (10) MT4T or the Mobile Technology for Teachers, (11) MTEi or the Mobile Technology on Emotional Intelligence, (12) Toolkit for Building Disaster-Resilient Technologies, and (13) Weaving Identities, a toolkit towards a Southeast Asian Community. This partnership with SEAMEO INNOTECH has been recommended by technical members of the CHED National Vetting panel when she presented the University’s IDIG proposal. SEAMEO INNOTECH will also assist TAU on how to set up the operationalization of the University’s EdTech Laboratory which will be the venue for online instruction delivery, blended learning and instructional material development.